Interested In a Permanent Legacy To Support The Environment? Consider Leaving A Bequest In Your Will Or Trust To An Angeles Conservation Foundation Endowment. We think of our legacy in many ways. We think of…our descendants, our life’s work, our written words or artistic creations. Your legacy can also be a philanthropic endowment carrying on programs important to you that express your values. An Angeles Conservation Foundation endowment is one way of creating such a legacy, a way that can provide continued support for things you care about year after year. The goal is to ensure that the principal of your will or trust bequest will provide an income year after year to support the things you care about. An endowment is a gift usually made through a bequest in a will or trust to a nonprofit like the Angeles Conservation Foundation for the ongoing support of the organization’s mission. The principal amount is kept intact while the investment income is available for use each year to support the goals of the organization. Q. Why are endowments important? An endowment creates financial stability, by providing a stable continuing reliable base of funds for conservation projects. Q. Who oversees Angeles Conservation Foundation endowments? The board of directors of the Angeles Conservation Foundation has legal and fiduciary responsibility for Angeles Conservation Foundation Endowments. Q. How are endowment investments managed? The overall investment objective is to earn a safe consistent steady and growing income that will keep up with inflation. Q. How soon will funds contributed to endowments start to generate spending for programmatic purposes? As soon as they start generating income, generally within a year. Q. What is the minimum amount to establish an endowment? 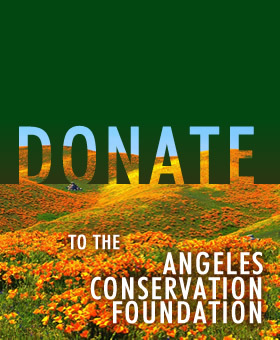 There is no minimum to contribute to an existing Angeles Conservation Foundation endowment. The Angeles Conservation Foundation minimum to create a new endowment is $25,000. Q. How Can I Fund an Endowment? You can name an Angeles Conservation Endowment a beneficiary of your life insurance policy or bank account or stock brokerage account. Your life insurance agent, bank, or stock broker will have the necessary forms or you may be able to do this online. Q. Can an endowment be designated for a specific purpose? Absolutely! Endowments are a perfect vehicle for creating a legacy for a specific purpose that lasts forever. Payout from these funds can only be spent in support of the fund’s designated purpose. Q. Are my donations to an Angeles Conservation Foundation Endowment deductible? Yes, donations and bequests to an Angeles Conservation Foundation Endowment are fully deductible, to the extent allowed by IRS tax rules. Q. How are the Funds in an Endowment Invested? The Foundation’s endowment assets are invested in a variety of stocks and mutual funds to earn a stable and growing income. The ACF invests mainly in well established companies with a history of growing earnings and dividends. Most of these companies will be in mutual fund portfolios like Vanguard’s Dividend Growth Fund. Currently the ACF endowment accounts earn approximately 5% a year. Q. How can I contribute to an endowment? Q. Can I create my own endowment? Yes. While the existing Foundation endowments should meet needs of most donors, if you have some specified purpose, you can create your own endowment. We advise you to consult with us first so we can help you structure the endowment to accomplish your purposes. Q. Can I make a donation to an endowment during my lifetime? Yes. Simply write a check to the Angeles Conservation Foundation with a covering letter specifying which endowment the funds are intended for. Q. Can I get help with my will or trust, if I want to include the Angeles Conservation Foundation in my will or trust? Yes, contact us at info@angelesconservationfoundation.org. If you want to make a bequest in your will or trust for a specific purpose, you can name one of the Foundation endowments as the beneficiary; or if you want to make a bequest for another purpose, simply contact us at info@angelesconservationfoundation.org. Q. How difficult is it to add an Angeles Conservation Foundation endowment to my will or trust? It is easy. You can simply include the following language in your will or trust. Q. Are there other ways to leave money to an Endowment? Yes, one of the simplest ways is to name the endowment as a beneficiary on a bank account or stock brokerage account. When you open a bank account, or have a life insurance policy, or have a stock brokerage account, you can name a beneficiary. If you name an Angeles Conservation Foundation endowment as your beneficiary, then assets will automatically be transferred to the endowment upon your death. If you already have a stock brokerage account, or bank account, you can easily change the beneficiary to the Angeles Conservation Foundation, or make the Foundation one of the beneficiaries, by filling out a form the bank or brokerage will provide you upon request.